I discovered the Falling Kingdoms series in late 2016, and basically binge read books 1-4 in preparation for the release of Crystal Storm. Falling Kingdoms has been marketed as YA Game of Thrones which kinda makes sense as it is full of political intrigue, fights for a throne, and multiple POVs. Oh, and death. Morgan Rhodes is not afraid to kill the people you love. 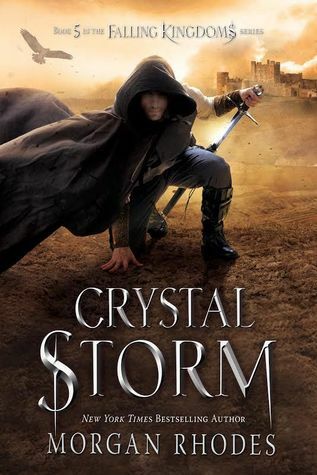 I can’t give you a detailed plot summary of Crystal Storm since it is the second to last book in the series, and it would spoil some major plot points from previous books. But, here is what I can tell you. Falling Kingdoms is the story of three nations in the land of Mytica – Limeros, Paelsia, and Auranos – which have settled into a very uneasy peace. The murder of a Paelsian boy sets off a firestorm that threatens to devolve into outright war. This story follows four main characters Cleo, Magnus, Jonas, and Lucia as they try to navigate this world, learn about their magic, fight for their people, and claim their thrones. But, the best part about these characters is they are all complex, morally gray, and willing to make sacrifices for what they believe to be right. “I think we all deserve to die for something we’ve done. For the first four novels, Falling Kingdoms was consistently getting better. I mean, Frozen Tides pretty much blew my mind. But, I have to admit, Crystal Storm was a bit of a letdown. Now, don’t get me wrong, it was a good book, and I liked reading it. It moved the plot forward, and it has some swoon-worthy romantic moments. I liked both Lucia and Jonas more in this novel than I ever have before, and our heroes started to realize that maybe they don’t have to rely on fate, prophecy, or destiny, but can make their own futures. But…I wanted more. At only 379, this is the shortest book in the series, and it felt a bit rushed. Plus, there seemed to be some plot lines that were introduced just to keep to lovers apart and then dropped like it was no big deal. And, because we got more information on a slew of new characters, I don’t feel like I have enough time with the big four. I still love this series and characters, and I will anxiously await the release of Book 6 (the cliffhanger at the end of this book almost killed me as I frantically searched for more pages), but I am a bit nervous at how well she’s going to tie this all up.